SCT’s 13th Birthday Celebration – Day 2!! Good morning SCT friends! Welcome to Day 2 of our 13th Birthday Celebration. Inspiration, cheer, and prizes, oh my! If you’re joining us for the first time, welcome! Be sure to click HERE to join in on yesterday’s birthday kick off! Today, design team members Virginia Nebel and Jen Gallacher are here along with our friends from Simon Says Stamp, Pink & Main, Doodlebug Design and Echo Park Paper to help us celebrate! Ready to get started…let’s go! 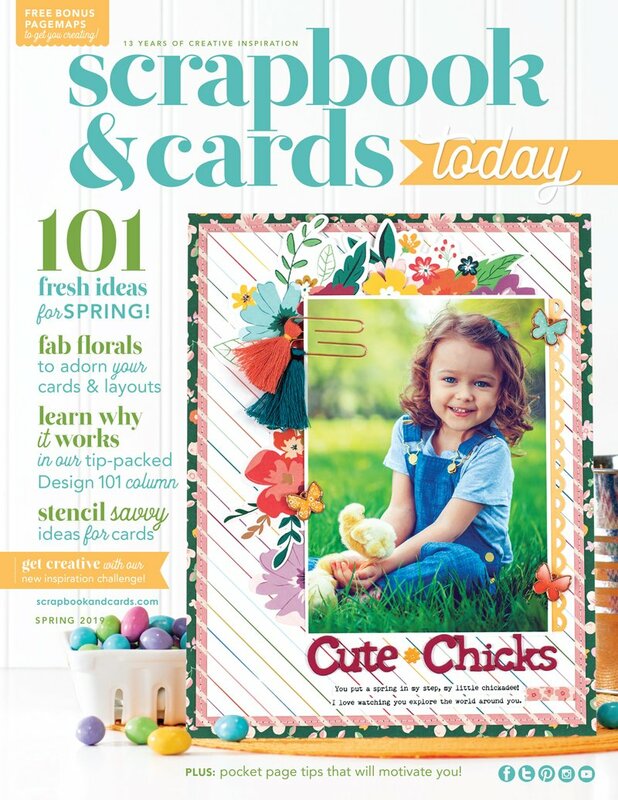 Happy 13th Birthday Scrapbook & Cards Today! Sending a huge shout out to Catherine (and her family) for their amazing success! Today I’m sharing a page celebrating friendship and community through the Crop & Create events. I’ve scrapbooked some beautiful smiles and memories with the exclusive Crop & Create stamp set! Many that have attended an event will recognize the beautiful fan wall in the photo booth and I’m sure have snapped a photo or two! You can choose to colour the fans with markers or I just stamp them on patterned papers and then punch them out. There are two fan styles and by using various sized circle (1”, 1.25” and 1.5”) and scallop circle punches you can create many different sized fans. The journal die cut frame and speech bubbles are created from a free SCT cutting file (Spring 2014 pocket cutting file set) which you can download from the SCT website. Here is a birthday card using the fun Let’s Party collection by Echo Park. I used the fans from the Crop & Create stamp set to add a little flair to the card. Happy Birthday SCT, wishing you another awesome year ahead! Hello! Jen Gallacher here! Shaking things up for a special birthday card featuring a Jillibean Soup Shaker Card and REAL candy sprinkles. This card features a cloud die cut shape that is turned into an ice cream scoop with the NEW Jillibean Soup Ice Cream die and stamp set. Jillibean Soup offers several different shaker fillers including beads, wood veneer shapes, sequins, foam balls, and more; but you can also use real candy or other items in your shaker cards. Adding realistic items makes this card just a little bit more special. Wishing SCT a VERY happy birthday! Happiest of birthdays to our friends at Scrapbook & Cards Today from Pink & Main! We have a prize package just for the occasion, including our Happy Birthday Script and Celebrate stamp sets, and our It’s a Party 6×6 paper pad! Doodlebug Design would like to wish Scrapbook & Cards Today a very Happy 13th Birthday! We feel so fortunate to be a partner with this wonderful publication and the beautiful people that work so hard to bring us inspiration! We would love to offer one very lucky winner a birthday party prize! 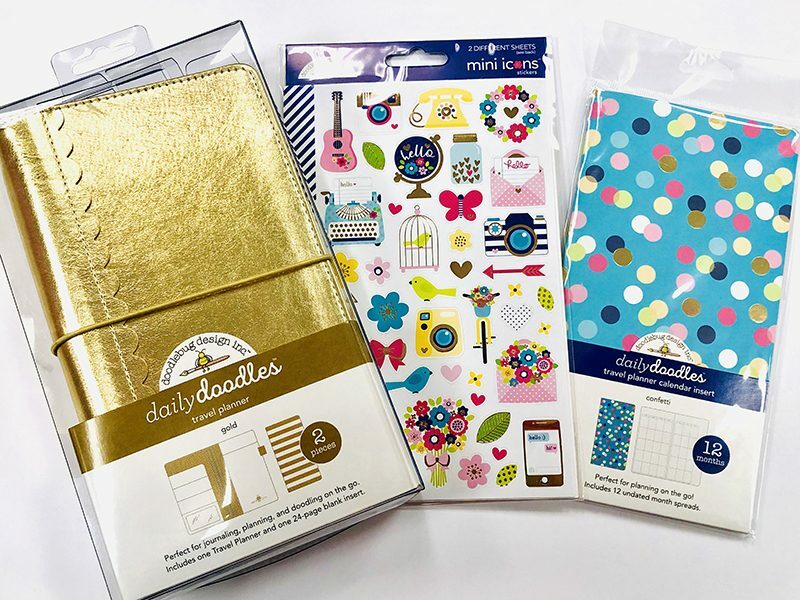 And what better way to celebrate than with a gold daily doodle planner, a confetti calendar insert and some sweet mini stickers for a bit more bling! Let’s get this party started!!! 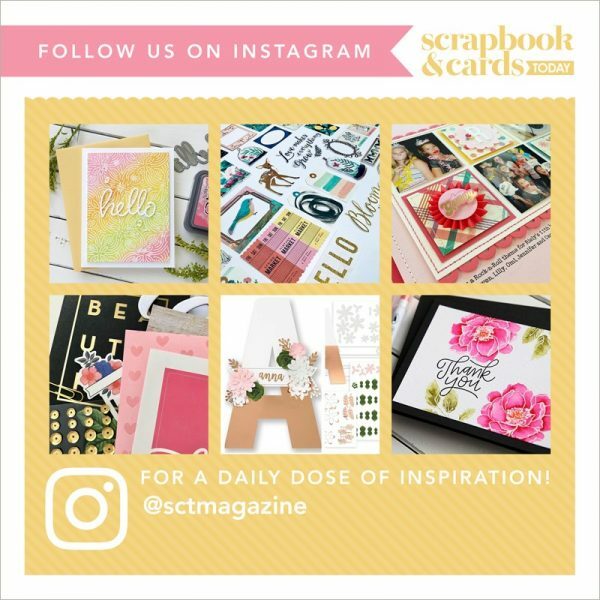 Happy Birthday to Scrapbook & Cards Today! The inspiration, products and overall feel of your magazine can’t be beat! We wish only the very best for you and can’t wait to see what the future holds! WOW!!! Another amazing day with our fabulous team and partners! Celebrating is always fun when you wrap up the day with a fantastic prize package! 1. Leave a comment below and today, tell us where you call home! 2. Comment to be left by April 4th at midnight EST. 3. Winners will be announced right here on April 5th! We always love when you take a moment to thank our partners and hope you will take another moment today to do the same either on their Facebook page or on Instagram…or both! Send them a direct message or look for their post about today’s giveaway. Thank you for joining us on Day 2! Be sure to join our team and several of our partners tomorrow for another exciting day!! Happy, Happy Birthday! What a wonderful giveaway! Sending some warm Spring sunshine from Georgia. Wishing you a very happy birthday from Paducah KY.
Ummm. WOW! The projects look AMAZING! And the goodies! There is no words! HAPPY BIRTHDAY! Home has always been Toledo OH. Happy birthday from Central California! Thank you for the opportunity. Happy birthday SCT! Virginia’s layout is incredible! Awesome prizes today as well! Hello and happy birthday from Willow Beach Ontario Canada!! Awesome inspiration today! Happy Birthday (day 2!) week!! Celebrating with Roth from Lancaster, California! Happiest of birthdays! Awesome prizes! I’m sending warm (I wish…its cold here! Lol) wishes from Colorado! Enjoying this birthday with you in Lakewood, Colorado! Some of my favorite companies representing today. I live in Alabama. So thankful for SCT. Happy birthday! Happy Birthday from Georgia. Another day of wonderful prizes! I live in BEAUTIFUL Utah where we have the GREATEST SNOW ON EARTH! thanks so much for the chance to win. Squeal..what an amazing collection of goodies for Happy Birthday day 2! Happy Birthday! I’ve spent many happy hours creating papercrafts using Scrapbook and Cards ideas. Today’s projects just add to the inspiratiin. Thanks. Oops, forgot to add, Happy Birthday from Illinois! What a fantastic way to celebrate your birthday! Happy day 2 from Anchorage, Alaska. Another mind-blowing prize package from today’s sponsors – thank you so very much for the chance to win!!! Fun and festive projects and prizes. I am from NE Ohio. What a wonderful prize package! HB2U from Papillion, Nebraska where winter doesn’t seem to want to end! I so love the layout from Virginia! Day 2 is fabulous with amazing sponsors and prizes!! The ice cream shaker is so clever…and love the addition of ‘real’ sprinkles as the shaker element! Scrumptious! Two place to call home: Edmonton, where my family lives and where I was raised, and Cochrane, where we live now. Thank you for the amazing inspiration, the giveaway opportunity and the smiles! Day 2 of fun things to make, products to add to wish list. Love reading comments also. Hot and sunny in Louisiana. Thanks for the opportunity to have such a wonderful assortment. Nice day in Lakewood, Colorado. Love the projects that are showcased! And the prizes are awesome! Happy Birthday SCT! Reading the blog posts from WA state! Pacific Northwest which a great place to craft and celebrate in my opinion! Happy Day! Great products from some amazing partner companies! Happy Birthday! Love the colors in the Crop & Create layout!! What wonderful prizes for day 2 of your birthday celebration! Sending birthday wishes from Rochester Hills, Michigan. 13 years of sharing and teaching creativity! Happy 13th and thank you for the inspiration. Happy 13th Birthday, SCT! You have provided so much information and inspiration over the years, thank you. The projects today are all fabulous and the prize package is unbelievable. WOW! Another great day of fabulous prizes! I hail from Langley, BC! Happy birthday SCT!!!!! Love the layouts and cards. What a beautiful line from Echo Park. Birthday greetings to SCT on their 13th year from Port Coquitlam, BC, Canada. Happy Birrhday SCT!! I couldn’t have imagined the prize packages of yesterday and now all this!!!! This is amazing. Your partners love you SCT! I’m from the smack dab middle of Pennsylvania. It’s sunny today. Happy Birthday SCT! Waving from Northern Virginia on this beautiful spring day! Great projects and awesome giveaways today! Happy Birthday from Oakville, Ontario! Good sunny morning from Michigan! Happy Happy Birthday!! Wishing you many more! Thank you for the wonderful inspiration! 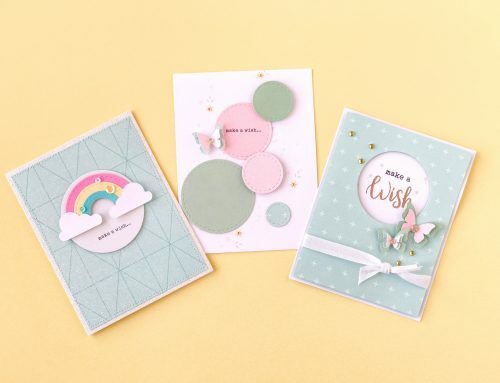 The fun cards and that delightful layout are so inspirational! Thank you to each of today’s sponsors. Left them all some love!! What an amazing prize!! So many fun goodies!! Happy 13th Birthday SCT from Maine!! Happy, happy birthday from Florida! I love shakers so Jen’s ice cream shaker ‘melts’ my heart! Happy Day 2 of your birthday celebration. We have weeklong celebrations for birthdays in our Virginia home, also. I live in southern California. Happy 13th birthday. Awesome prizes and projects! Happy Birthday from Missouri. Happy Birthday! Wow, what a wonderful prize package! cloud ☁️ into the top of an ice cream cone 🍦! ! This prize package certainly would make for “the best summer ever” in my home town of Ancaster, Thenks for having such a wonderful birthday 🎂 🎁 celebration!!! Happy 13th bday from Missouri. Love the umbrella shape. I love the scrapbook layout. I want to be able to scrapbook more like this, instead of just matting photos and putting them down. Birthday cards – oh my! I”m still here in Texas today – but I will be here always. Happy 13th Birthday SCT. We just recently moved after 41 years in the same house to a new place we now call home. When I pull into the driveway of our new home, I get the overwhelming feeling that “this is home” . . . Wildwood, Missouri is our new home and we love it. Side note – I love seeing the talent and inspiration that comes out of this magazine. Love every single page, every single issue. The prize package looks wonderful and would be perfect for my family’s upcoming trip to the beach! What a celebration, love SSS, Doodlebug, Pink and Main and Echo Park for their wonderful celebration gifts! Nice and warm here today in sunny Gilbert, AZ! Thanks to all the projects featured yesterday and today, lovely! Happy 13th SCT from Auberry, CA! Thank you to all the work you do to bring us such wonderful inspiration goodness! Thank You to all the sponsors in this celebration who are providing such wonderful creativity and prizes to celebrate! Such a fun layout and cards! And more fabulous prizes today! Another nice spring day here in Calgary – so nice, even though I’m sure it’s just a tease! You and your sponsors are being so generous in honor of your birthday celebration! Happy birthday and thanks for sharing!! Happy Birthday SCT! Lots of fun crafty goodies for the lucky ones. Sending wishes from Malaysia. Another day of awesome prizes and projects! HB2U from Ontario, Canada!! Wow! Amazing LO & Card – love the inspiration and I do LOVE birthdays! Another day of amazing/ generous prizes – thank you. Charlene ~ Victoria B.C. Love today’s cards! Happy birthday from Saskatoon, Saskatchewan! Happy Birthday SCT. I live in Kentucky but was born and raised in Missouri! Happy birthday from the beautiful Pacific Northwest. I live in Everett, Wa where it is currently sunny! Yay! So many fun prizes today. Thanks for a chance to win! Wow! Only day 2 of these fabulous prizes and it just keeps getting better! Such wonderful sponsors too! Home is Kingston, Ont for me! Happy Birthday. I am loving all the inspiration. I love the shaker card. Happy 13th Birthday from Cambridge, Ontario. Happy birthday! Wonderful projects and prizes! Happy Birthday from Kodiak, Alaska! Just got my Spring copy of the magazine and can’t wait to open it up and be inspired! Another day of fun celebrations! Loved the look of the stamped medallions on patterned paper! Happy birthday from Oakley, CA! Happy Birthday from Kingston, Ontario. I love all the great ideas, inspiration and of course all the wonderful prizes. Happy Birthday! My home is Navarre, Florida. Beautiful white sandy beaches. Wonderful ideas and awesome prizes. Happy birthday! Sending love from California! I’m from Edmonton, AB, Canada! Oh My!! All this Birthday goodness! I cannot handle it 🙂 I am in love with the Crop & Create stamp/die set and have used it already. I was also lucky enough to see that beautiful 12×12 layout in person at C&C Moncton 2019. Love. Thanks for another great giveaway…from Green Bay, WI! Deb from the Phoenix Arizona area here. Happy 13th Birthday again. Another great post with lots of nice cards and layout. I really enjoy all that you do as a magazine and with your posts. Great prizes too. Have a great day. Oh wow, love the cards. I didn’t think of stamping on paper with a striped pattern. Happy 13th birthday SCT. 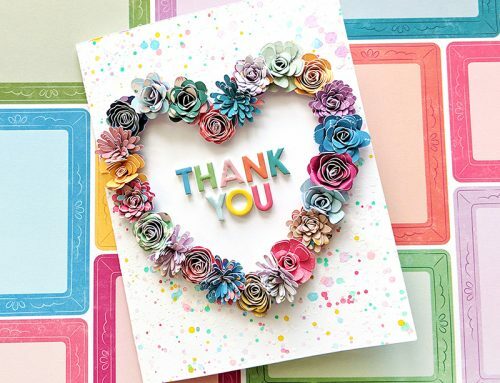 Thank you to Simon says stamp, Pink & Main, Doodlebug Design, Echo Park paper. Happy 13th Birthday SCT! Beautiful products and always great ideas. 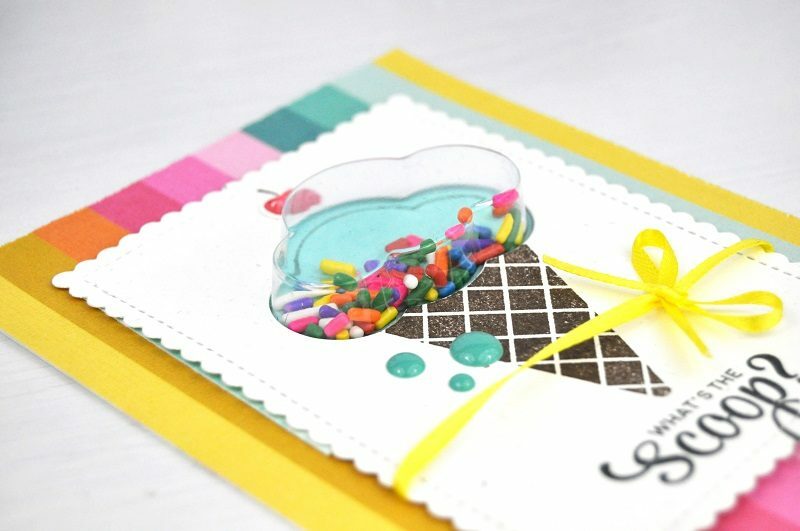 Especially loved the ice cream shaker card, I am so doing this soon. Thanks for the opportunity! Home is Southern Manitoba. Happy Birthday from Dale in Rhode Island! What a great celebration! Happy b-day from Columbus, Ohio! Cindy from Michigan wishing SCT a very Happy Birthday. Love the projects and giveaways from the different companies. Good afternoon from Ottawa again. I feel overwhelmed by the many sponsors and their generous prizes. Happy birthday SCT and thanks to all the sponsors. Happy birthday SCT and here’s to the next 13! Wishing you happiness and continued success from Central Nebraska! Happy birthday from Cottondale, AL! Happy happy birthday S&CT!!!! Another stunning prize package. My fingers are crossed. Happy Birthday from Croatia, Europe. I don’t know if giveaway is for US residents only, hut still Happy 13th. I love your products, love your layouts.I got your Scrapbook calendar from my hubby for Christmas 2015 and I still use it as an inpiration. THANK YOU FOR KEEPING US CRAFTY TYPES INFORMED! WHAT A GREAT BATCH OF GOODIES TO HAVE A CHANCE AT WINNING! So happy to discover SCT through Cathy Zielske’s blog. Love and Happy Birthday from Georgia. I really love how stamp and product companies support each other and work together for the crafty enthusiast. You all keep it so fresh and fun. The inspiration in today’s projects show off just what I mean. Thanks! Happy Birthday from New Jersey! Happy Birthday from the land of poppies, Lake Elsinore, CA! Home for me is Indianapolis, IN. I’m excited about all the amazing prizes today. Thank you to all the generous sponsors! Happy birthday from Comox, BC. Great prizes. Love it all and someone is going to have a great mail day soon. What a great celebration and prizes!!! Happy Birthday! What great prizes! I guess the giveaways are national, but for the record, I read to you from a small village in the north of Spain and the projects you propose are great. Thank you! Happy happy birthday! I just love my issues of SCT and the SCT sampler!! What wonderful prizes! Thank you for inspiring us. I love cards with some 3D content, so those sprinkles are totally awesome! Happy Birthday to you. Jessica from San Antonio, TX! Wow, your sponsors are so generous! Happy birthday and thanks for the chance to win! Love Virginia’s Crop & Create Pages. Love all the generous gifts thanks to your lovely sponsors. I’m smitten with the Doodlebug designs gifts for the birthday celebrations. I’m in Ottawa, Ontario Canada. Thank you for all you do SCT team! Colfax, Iowa, USA. This is a great collection! Happy Birthday from Edmonton Alberta Canada! Happy birthday day 2…from Abbotsford, B.C. 🇨🇦 weather permitting hope ti go outside fir inspiration. Wow! That is an amazing giveaway. Happy birthday from Eugene, Oregon! All the prizes are great. A lot would be new to me and fun to try. I am from Dover, Delaware. Happy happy Birthday from sunny (but still cold) Ontario! Happy Birthday SCT!! Love all the inspiration!!! I love the ice cream cone card from today! I’m from Cambridge, ON. What a way to celebrate your birthday! Here’s to many more years of SCT! Happy Birthday from Cypress, Texas. Such great prizes! Happy from Missouri! Happy birthday from Indianapolis, IN! Happy 13th birthday and many, many more from sunny Michigan. I love all the inspiration your magazine provides. Loving that scrapbook page with the Crop & Create set. Another great day of celebration! Beautiful projects and lovely prizes.. celebrating from sunny Toronto! Happy 13th Birthday SCT! My home is in Cambridge, Ontario. Thanks for the chance to win! Another post full of beautiful projects! Happy Birthday from NB Canada! Happy birthday from St. Louis! Thank you for all the amazing giveaways!! Happy B’day from South Carolina. Happy Birthday from sunny Texas!! Thank you so much for sharing with us!!! Happy 13th birthday, SCT!!! 🎈🎉🎈. You have some GREAT companies helping you celtiday!! In fact they are some of my favorites! Best wishes sent your way from my home in Pennsylvania. Happy Birthday! Home for me is Saskatchewan. Happy Birthday to SCT. I am sending greetings from the Atlanta, Georgia area! Happy Birthday! Sending wishes from Vancouver! Happy birthday again SCT! We live in Cambridge Ontario and are just starting to welcome Spring. Amazing prizes, thanks sponsors!!! Happy 13th Birthday again SCT! I live in Mesa, AZ. It’s already 90 degrees here today. So Fun! Thank you for the amazing opportunity and for the amazing giveaway of prizes! Wow everyday just gets better and better. What amazing inspirations and great companies being so generous! Thanks for the opportunity to win! Shouting “Happy Birthday!” from Edmonton, Alberta! Many happy returns SCT!! – from Victoria, MN. Happy birthday from Texas! I can’t believe all the goodies you are giving away! Happy Birthday from Parry Sound, Ontario! Love the inspiration and the giveaways today! Happy Bday from PA! Happy 13th Birthday SCT from Woodlawn, Ontario! Love all the product… fun week! Happy birthday! I call Cedar Rapids, Iowa home. Happy 13th birthday SCT!!!! I am from Las Vegas, NV! And I’m am so loving all the inspiration we get to feast on daily! Happy Birthday day 2!!! Thanks for 13 years of the best inspiration and another thank you for all the wonderful and inspiring challenges on fb! Loving them!! Happy 13th birthday from fabulous Las Vegas Nevada! Happiest of birthdays SCT! Absolutely love your magazine and look forward to it every quarter. I call San Diego, CA home! Love it here. Thanks for the chance to win this awesome giveaway. Wow! What a birthday! Happy lucky 13 from Houston, Texas. Happy Spring colors all around for a happy birthday celebration! Best wishes and thanks for a great giveaway from Blacklick, Ohio. Happy Birthday from the beautiful Texas Hill Country! Happy Birthday from Frederick, MD! So summery! Looking forward to spring soon in Winnipeg! I am corresponding from southern Alberta. Congratulations on turning into a teenager! Great prizes again! Hello from Calgary Alberta! Happy birthday from Denver, Colorado! What a wonderful prizes! Thank you for the chance to win! Happy !3th!!! Home for me is New Hamburg, Ontario, Canada! Wow Virginia and Jen what a great projects you both made for today, love them both. And a great thanks to all the companies who participate with stunning prices. Happy Birthday, Love the layout and what a fun die cut is the remember box. Way to cute. Birthdays are always fun. I live in London Ont. Thanks for sharing the projects and thanks for the giveaways. So many of my favorite companies are celebrating with you! Happy 13th Birthday, SCT! Such fun projects! love the fan stamp – so cheerful and versatile. Beautiful cards, great ideas, and terrific sponsors make this Michigan girl happy! Thank you for the chance to win those amazing prizes from sunny California. HAPPY 13TH BIRTHDAY! Happy 13th birthday! Such a lovely way to celebrate becoming a teenager – the pink and teal palette on the layout is gorgeous, as is the sweet birthday card. Thanks to the sponsors for the generous prizes each day. Hugs from the Caribbean. So cute!! I love the ice cream cone shaker! Happy 13th birthday to you all! Just finished reading the magazine on line. Love it and love all your advertisers. I currently live in Mesa, AZ but HOME will always be southern California! Happy Birthday from South Dakota! Happy Birthday!! Beautiful layout. Home isGeorgia!! Happy Birthday from sunny South Florida! Such an awesome way to celebrate…Amazing prizes. What fun creations. I really love the layout too! And the card with sprinkles is too cute! Hello from Edmonton, Alberta. Singing “Happy Birthday “ from London, ON! Thanks for 13 wonderful, creative years of inspiration! Happy birthday…so glad you’re gping strong! Amazing and generous prizes. Sending happy wishes from Maryland USA. Happy birthday SCT from Brantford Ontario!! Thank you for being a a constant source of inspiration!!! Maui, Hawaii is my home. What generous prizes! Thanks for the chance from Ohio! Yesterday, I told you where I call home, so today I’ll say that my previous home was in Pewee Valley, KY! Happy birthday from Toronto! Home has been St. Thomas, Ontario; Toledo, Ohio; Fresno, California; Edmonton, Alberta; London, Ontario; Grande Cache, Alberta; Calgary, Alberta; and now, Toronto! Happy birthday from Troy Missouri!! Oh what amazing projects and fabulous prizes! So generous! Happy Birthday from Seabeck, WA! Happy 13th from Montréal! Today’s cards are so colourful &fun. And the famous fan wall is always a highlight. Love the little speech bubbles on the layout. Happy Birthday from Winlaw BC … great inspiration ! Hello from May’s Landing, NJ! Happy 13th!! Thanks for the chance to win!! Happy 13th birthday! And many happy returns of the day! Love that cute shaker card! Best Wishes for continued success from Milford, Ohio! Another amazing day of celebration! I am a Vancouver, B.C. Canada gal! Everything is so much fun. What a celebration. Happy happy birthday from Indiana! Happy birthday from Yorkton, Saskatchewan, Canada. I love all the prizes! Hard to pick just one. More Awesome inspiration and GREAT BIRTHDAY PRIZES! Happy Day! I am from Chicago, IL! Thanks for day number 2!!!!! I’m coming to ya live from Grande Prairie AB!! I really love the vibrant colors and fun patterns today! Thanks for the inspiration, I’m from Michigan. Such great prizes, from amazing companies. Enjoying a 70° day here in the western suburbs of Denver, Colorado. Your officially a “teenager”!!!! Happy 13th Birthday. Home is Henderson, Nevada. Chilly southeastern Wisconsin is my home. Happy birthday from Cleveland, Ohio! Hi from Salt Lake City, Utah. The Doodlebug swag is delicious!!!! Commenting from 10 minutes down the road from SCT’s home base here in Markham On! What an awesome bunch of prizes! Thank you SCT and sponsors! Home is in Fonthill, Ontario. Today’s package is amazing!! Thanks for the chance to win! Hello from Locust Grove, Georgia! Wishing Scrapbook & Cards Today a Very Happy 13th Birthday! Happy Birthday from Rochester, Minnesota! Love all of the cute ideas! Happy Birthday!! What an awesome giveaway today. Home for me now is Calgary, Alberta. Love Birthday celebrations that last longer then the birth day! Here’s to many more!!!! Coming from Chicago, Illinois. Happy birthday week SCT. Home is Welland ON,, Just down the road from Fonthill, as posted in the comment just ahead of mine. The layouts are gorgeous. Love the prize package. Thank you. Happy Birthday! From Oceanside, California! Many wishes to SCT for continued success in the years to come! Happy Birthday! Vancouver Island Fan! Happy Birthday from southeast PA,. Love the 4 seasons we enjoy. another great day another great set of giveways and demos. Happy birthday! And we get the gifts! Today’s prize is amazing. I hope I’m the lucky winner. I’m a reader from New Zealand. Happy Birthday!! Here from Sunny Florida!! Happy Birthday SCT from Alberta! Happy Birthday from Santa Clara (Silicon Valley) California! Love those birthday cards…especially the little balloon doggie! Thanks for having such a wonderful party! Love the crop and create stamps. Have a few pics from those. Originally from Calgary. Now in Portage. So many great projects and prizes – all the star eyes! Happy birthday to SCT!! I’m sending you birthday wishes from my home in Houston, Texas. Happy 13th! Happy Birthday from Santa Clara (Silicon Valley) California! Love the birthday cards…especially the little balloon doggie! Thanks for having a wonderful party! Another great day full of great projects and prizes! Thank you from SK. Wow are those some great prizes! Happy Birthday from sunny Florida! Love the layout! Happy Birthday team! So amazing…what an awesome birthday celebration! Happy birthday from Long Island, NY! Thanks for the chance! in the fun birthday post! A big wonderful hello from Calgary! I love these projects! They are fun and full of life just like SCT! Happy Birthday! so much looking at all the things I can make. And…the celebration continues! I love, love, love the shaker ice cream cone card and the birthday card with the balloons! Happy 13th Birthday from Palmer, Alaska. I am so in love with Virginia’s layout! The fans are amazing and I love the idea of stamping them on patterned paper and putting the brad i the center kind of reminds me of the ferris wheel! 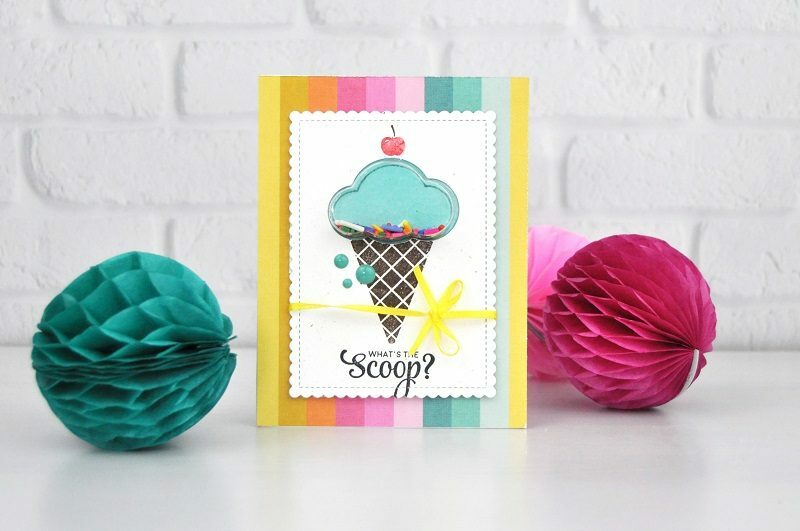 The bright and cheerful icecream card is so “sweet” with candy sprinkles! Thank you for sharing and inspiring! Happy day 2 of your 13th Birthday Celebration SCT! Many thanks to the wonderful partners for sharing and generously giving prizes! oops Home is Mount Hope, Ontario!!! Happy Birthday from the south coast of Sweden! Happy 13th SCT from West Palm Beach, Florida USA. Happy 13th birthday, I call home Oxford, Alabama. This Nova Scotia girl is loving all of the great projects and prizes! Happy 13th Birthday, SCT! I love the inspiration I get from the magazine and blog. Greetings from Riverview, Florida! Celebrating with SCT is so much fun, we get to see beautiful inspirational projects and a chance to win prizes too. Thanks for sharing your birthday with us. I’m from Pleasant View, TN. Happy Birthday and thanks for all the inspiration you deliver all year long. Always so many great ideas!! Beautiful projects today! Happy Birthday from the great state of Texas! Happy Birthday, fron Southern New South Wales AUSTRALIA. Love all the fresh ideas. Happy birthday!! What a great milestone! I call Michigan home. Greetings and Happy Birthday from Lynnwood Washington! Love today’s projects and prizes! Home is from the beautiful state of WASHINGTON! Another day of amazing prizes! Sending Birthday greetings from Massachusetts! HAPPY BIRTHDAY SCT! I am so blessed to now call Nova Scotia Canada my home after living in the Ohio, US my whole life. And getting to attend my first Crop and Create event this month in Moncton has been the highlight so far! Catherine, I love this magazine and the awesome teachers/designers you showcase, the products/manufacturers you represent and all that this magazine does for this crafting industry. Truly a gift. Thank you. Thank you. Thank you. Simon Says Stamp has been my favorite online store for many years. Thanks for the opportunity to win! Yet again my mind is blown with the amount of inspiration packed into your post and the generosity of your partners,! We are all winners just because we are a part of your amazing community! I love today’s creative eye candy and this prize package is incredible! A free shopping spree and lots of awesome goodies makes me smile from ear to ear! Thank you for the chance to win such amazing prizes! Happy 13th Birthday! TFS! Happy Birthday from Karachi, Pakistan my current home. Awesome prize pack today. This would be a great end to my ‘month long’ 60th birthday celebration! Another awesome day of products and projects! Hello from St.Catharines, Ontario Canada! Great projects and fantastic giveaways! Home is old bridge, nj. Love, love, love Virginia’s C&C layout! And Jen’s adorable shaker card! The prizes today are equally amaaaazing! I’m loving the scripty word stamps by P&M. Your sponsors are the best! Home is Brampton, ON! Happy BDay! From Temperance, MI. Thanks for the contest. Happy birthday day 2! Love those fantastic prizes! Have a great day from Waterloo, Ontario!! Happy Birthday from Geneseo, NY! It’s my birthday month too!!! Love being born in National Crafting Month….Love the layouts and the giveaway is awesome. Happy Birthday from Belleville On. Love it all…..
Bonjour from Moncton New Brunswick!! Wishing you a very happy birthday from Fairborn, Ohio! Happy Birthday from Toronto, Ontario! Happy Birthday from Ayr Ontario. I would love to attend a crop and create event one day…. thank you to your wonderful sponsors for all these fantastic prizes. Thank you for the opportunity to win.. 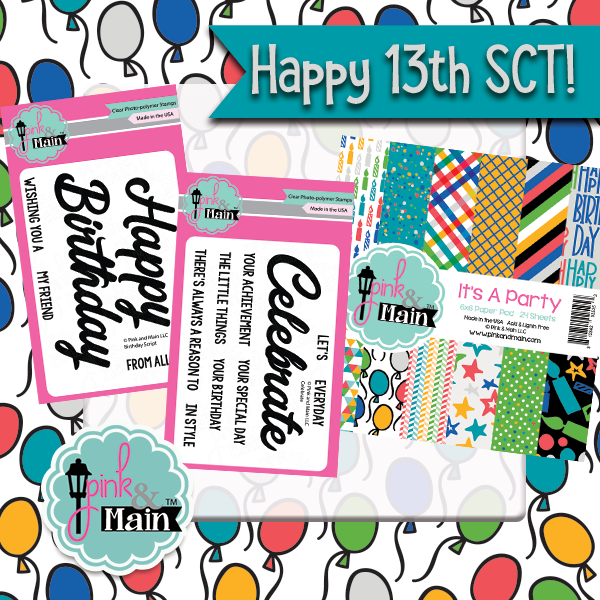 Thank you Simon Says Stamps, Pink & Main, Doodlebug Design and Echo Park Paper for sponsoring the prize package for day 2 of SCT 13th Birthday celebration. Happy Birthday SCT from someone who lives in Grove City, Ohio! Happy birthday! What a fantastic milestone!! Much love from Alberta! Amazing sponsors, amazing magazine. Just wow! Congrats on your 13th Year!! I call Casselman, ON Canada home. Happy 13th Birthday. So many creative projects and cards. Love them all from the Sunshine State of Florida. Thank you for this fun celebration. Sent from Michigan. Happy Birthday from Grand Valley, ON! What a beautiful lay-out. And prizepacks are amazing. Sure very welcome to give them a Home here in Tiel The Netherlands. Happy Birthday! Such fun project ideas! Happy birthday day 2 from Southern Ontario. This giveaway makes me excited to for the summer. Thanks for the chance to win a wonderful prize package! An amazing prize package! Thank you to Simon Says Stamp, Pink & Main, Doodlebug Design and Echo Park Paper! Happy Day 2 Birthday from Southern Ontario! Thank you for the chance to win this amazing prize pack! What truly warms my heart is seeing comments of love and appreciation from ALL OVER THE WORLD! Truly, your team has allowed your passions to become our passions! Congrats and many more years of continued success!!! Love the colours that were used in today’s projects. So like summer. What a rest idea to use real can’t sorinkles.I am from Calgary and we just got some snow! Not a great amount so these colours/projects are so good to look at. Home is in Saugus, California. Only day two, but having fun with the celebration – – Happy Birthday!! I like to celebrate my birthday for a week too! Happy 13th birthday from Spokane, Wa. Happy Birthday from Charlotte, NC! Love the shaker card! Happy birthday! I love the new Crop and Create stamp set. Can not wait to get my hands On it. Another amazing giveaway!! Love Love the shaker card!! Too cute!! Thank you so much for a chance to win!! Cool projects. Love the ice cream cone with real sprinkles!! Another amazing prize package – I love them all!! Happy Birthday from northern Illinois!! Wonderful prizes from some wonderful companies!! Love Echo Park!!! One of my favorite paper companies. Happy Birthday from Griffith, Indiana! Happy birthday and another day of amazing giveaways! Another day of great projects! I love seeing how you used some “older” digital die cut files, and it’s making me want to go a-hunting through mine to use on some layouts! I’m from the Baltimore, MD, USA area, where we are finally getting some hints of spring! Hooray! What a great day of projects and awesome prizes! Home is the New Hampshire coast. Love the Crop & Create page & stamp set! Gotta get me one! Home is Washington Township, NJ, USA! Birthday greetings from Bettendorf, Iowa! You sure have some great birthday packages! Thanks to all. Happy Birthday from Cape Cod. Happy 13th Birthday from Washington Court House, Ohio! Love the Echo Park package above. Would love to win! Thanks to all the sponsors for the giveaways! It’s fun to see the love from your sponsors and creative team. Well deserved, I’m sure! Happy Birthday SCT. Thank you so much to all the awesome sponsors. Hugs from Ohio on way 2 . Happy birthday from a scrapbook admirer in Parrish, Florida. Simon Says Stamp is how I discovered SCT! I love seeing crafty companies supporting each other. Happy birthday (day 2!) from Colorado! Love Virginia’s layout from her Crop and Create events. Might scraplift this one for the Add To Cart Girls memories! The prizes today – WOW! Awesome partners for sure! 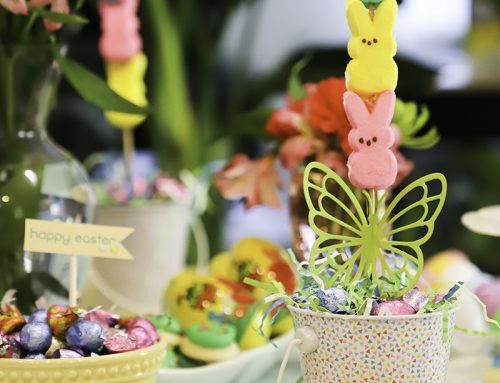 Happy Birthday SCT – you have the best parties!!! Four more fantastic prizes including a $50 GC. I would be thrilled to win these prizes. Thanks SCT! Happy Birthday from Ottawa, Canada! Happy Birthday SCT! Can’t waiting for Crop & Create this weekend in Winnpeg! happy birthday from London Ontario! Happy birthday from St Louis! WOW what a great crazy celebration. So fun to see the projects and imagine winning any of the great treats. Forgot to say happy birthday from the US borderlands. Warm wishes from southern Arizona. Whooo, Happy Birthday! Alaska is our current home, but Georgia is our forever home! Happy Birthday and thank you for this awesome gift for someone ~ in celebration of your wonderful publication! With love from Colorful Colorado! Happy birthday once again. You know what? I don’t think that there’s another magazine that have awesome partners to celebrate with us by offering such great prizes! 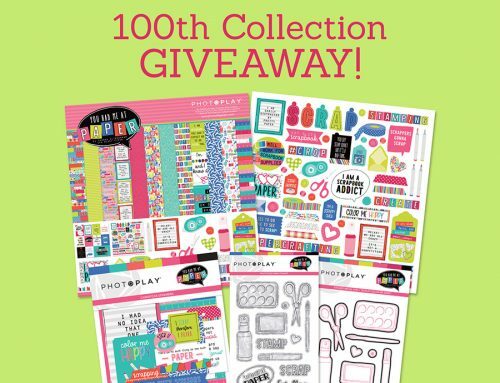 Just like yesterday the giveaway has such great items, I do hope that I win!! Hello from Loganville Georgia! These prizes are so fun! The lucky winner will be ready to create for summer! Lovely projects & prizes! Happy birthday SCT from New Zealand. Happy Birthday from Detroit, Michigan! A Georgia peach here to bring you some southern hospitality and a Hey Ya’ll! What an inspiring Crop and Create layout! Shaker cards seem so neat to make and receive! WoW! What giveaways! Need some sweet tea to revive me! Happy B-day S&CT!!! That ice cream cone shaker card is SO cute! HB, SCTmag! Thanks to sponsors for the gift possibilities! I call California home right now! That shaker card is awesome and that Summer collection looks amazing. that layout makes me really miss my local Scrapbook Store (went out of business more than 7 years ago) But she would carry all these great lines and more. Home for me began in Ohio but I landed in MD and have been here every since. Great card layouts and a fun scrapbooking one too! Home is Casselman Ontario Canada (near Ottawa). Home is Riverside, California. 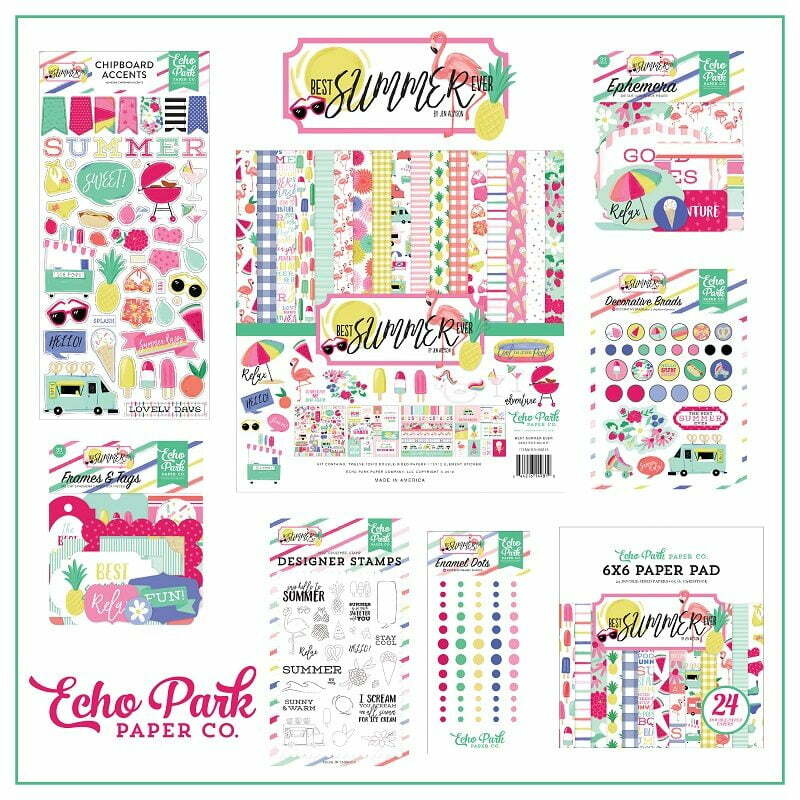 I just love all of the Echo Park Paper Summer Collection. Thanks to the partners for the beautiful product. We share the same birthday month! Woohoo! I call home the yellow pollen covered state of Georgia lol! Happy Birthday on Day 2 from Edmonton Alberta Canada! Happy 13th birthday from Ontario! Love all the inspiration you deliver, and your generous prize packages are drool-worthy! Happy 13th Birthday! Home is Montreal!! A big hello from Fort Worth, TX and a big thanks to all the companies and their prize packages. Happy birthday SCT !!!!! Another great set of prizes but mostly I love the creative inspiration found on your blog ! Wishing you a Happy 13th Birthday. Thank you for producing such a great magazine. My home is San Jose, California. Wishing you a fantastic 13th birthday!!! Enjoying all the fabulous inspiration as always from here in Orlando! Wishing you a happy birthday from Canada! Happy Birthday!! I love the layout and card – and can’t believe how generous your sponsors are!! Great projects! Thanks and Happy Birthday from Assiniboia, Saskatchewan! I’m still in Union City, CA. Wow, amazing set of prizes. Thanks for the opportunity to win. Super fun, festive projects! Amazing prizes–thanks for a chance to win! Happy Birthday on Day 2 from Texas. Love the fabulous ideas and wonderful prizes. Happy Birthday from Utah! What fun prizes you keep putting together! Happy Birthday! Any celebration at SCT is one not to be missed!!!! Thanks for always having inspirational projects and amazing prizes. Home is Waterloo, Ontario, Canada where hopefully Spring is coming with a vengeance!!!! Wishing SCT a happy birthday from Northern California! Such fun seeing all of the Birthday projects and prizes here in VA!!! Happy Birthday from Raleigh, NC! Super great projects and prizes! I currently call home Northern Alabama USA in the Tennessee Valley where it’s blooming like crazy here! I love the Spring! Happy birthday from Phoenix, AZ! I love all the wonderful projects and awesome prizes! Happy Birthday!! Thank you for a chance to win today’s prize package!! I call the Niagara Region (Ontario) home! Wishing everyone at SCT a very Happy birthday from Michigan. Hope we all have the best summer ever! Home is Maquoketa, Iowa. Happy birthday! I just recently came across your magazine, love it. Thank you. What great layout Love the spring like colours. So pretty. Thanks for the great give aways. Hope you have many more years of sharing and creating! Best wishes from Illinois. Outstanding magazine! Great ideas to scraplift. Thanks for all you do from Cambridge, Ontario. Happy Birthday and Best Wishes from Stuart, Florida. I live in Northern Illinois. Congrats! The happiest of birthdays to scrapbook and cards today!🎉. I love your magazine and all of the ideas and products in it! Greetings from Connecticut! Happy birthday from Batesville, Arkansas, oldest existing city in Arkansas! Love the prizes today and the ideas are gorgeous! The colors in the products are stunning! Would love to get my hands on all of it! How fun! Happy Birthday to Scrapbook & Cards Today! Thanks for 13 years of creative inspiration! I’m sending warm wishes from Egypt! What fun! Love all the bright colors in the projects and prizes! I live in Northern California, came from Vancouver, BC, Canada! Hello from Sherwood Park, Alberta. Looks like you are having a great birthday so far SCT! Thanks for being ‘born’!! Hello from St. James Minnesota.Happy 13th Birthday SCT! Fabulous page and card! Love them both. What wonderful prizes from great companies that I love! Thanks for a chance to win. Home is the house that I bought and live in with my wonderful boyfriend and cat in Oxford, MI. I am still in awe and thankfulness of the small little home every day. Happy Birthday from Chico, CA. Such colorful and fun projects. I call central Massachusetts home. Happy birthday! I’m in the SF Bay area. Happy birthday again! I’m from Sydney, the one in Australia. Happy Birthday And Greetings From The Okanagan in B.C. I am drooling over the projects AND the giveaways! I had to smile at Virginia’s Page. I was lucky to be at the Abbotsford Crop & Create in 2017. Looking at all of the projects from the ‘Master’s’ is such inspiration! Happy Birthday!!! I call Manteca, CA home. I currently live in Palm Coast, Florida but will always call Chicago home. Fabulous projects and prizes today. Happy, happy birthday SCT!! Home is Arlington, VA for now. Love the layout and the card. Fantastic giveaway. From Ottawa, Canada. Love the birthday ice cream shaker card! From Canberra, Australia. Howdy and Happy Birthday from the Lone Star State! Awesome creations and inspiration!! Such a great prize opportunity too! Thank you to the very generous sponsors. Happy birthday! Such beautiful products in the prize pack! It’s such a huge, happy birthday celebration! Thank you from Perkasie, PA, for the inspiration and the chance to win. Ciao from Florence, Italy. Awesome projects and prize pack!!! Brooklyn Park, MN (a suburb of Minneapolis) is home sweet home for me. Congrats on 13 years. Sending wishes from Eastern Oregon! Oh wow! I really need to get my hands on that Crop & Create Stamp set! I’m still here in little old Medicine Hat, Alberta! Happy birthday SCT from Calgary, Alberta!! Wishing you a wonderful birthday celebration! Happy 13th birthday! I currently call southern Maryland home. Dublin, OH is home for me. Happy 13th Birthday. All the best in Celebrating 13 yrs, wishing many more years! Birthday wishes coming from Mesa, AZ! Happy Birthday day 2! Northern Nevada has been my home for the last 21 years! 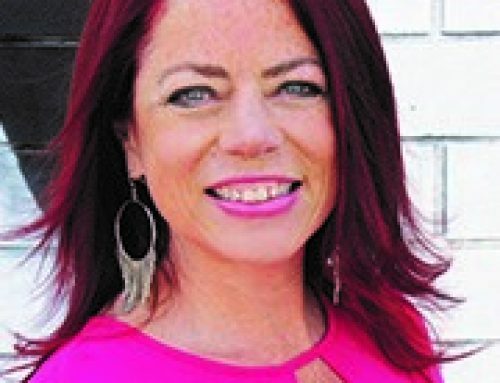 Happy Birthday from the Jersey shore! ABSOLUTELY FABULOUS projects to INSPIRE and SERIOUSLY AWESOME crafty goodies to EXCITE and DELIGHT – WOW – THANK YOU Everyone! Happy Birthday from San Diego! Your friends sure know how to celebrate! Happy Birthday from a devoted scrapper in Louisville, KY! Best wishes to all! What great prizes. Happy 13th birthday from New Zealand! So many cool birthday card and page ideas! Love that shaker ice cream cone! Thanks for a chance to win cool prizes. Happy birthday! I’m from a small town called Butner in North Carolina! Fabulous prize! Happy birthday from Winnipeg! Having a blast at Crop’n Create! Wow!! What a fabulous loot bag giveaway and I am loving that Crop and Create layout. Thank you for the chance to win..and happy 13th birthday! Happy Birthday from Red Deer, AB!! Happy, happy 13th Birthday SCT from your southern Alberta neighbor!! How clever to have a C&C stamp and die made — love, love it and how Virginia used it!!! All of my favorite companies sponsoring today’s prizes. Once again, the SCT design team rock the use of these products. Well done! Happiest birthday to you from New Hampshire! Beautiful pages. Stamping on pattern paper is on my “must try technique” list. Thanks for reminding me to do that soon. So many amazing ideas and layouts! Happy 13th birthday and thank you for the giveaways. I call California my home! Fabulous projects, thanks for the inspiration! Happy Birthday from little old Ponoka , Alberta where the Cowboys preform at the Stampede annually. While here pop on over to Lacombe and you may get to meet Gord Bamford , our very popular country singer. Sending BIRTHDAY wishes from the midwest in the state of KS! Hope you have a Wonderful 13th Birthday SCT and another 13 more! Love from LaPorte, Indiana! Happy Birthday from Webster NY!!! Although I’m Canadian in my heart. Much love and thank you! Huge Birthday hugs from Morin-Heights, QC!! Happy birthday from Arkansas! Love the layout and cards! Happy day from Bolton Ontario! Happy birthday from Olympia, Washington! Thanks for the chance to win awesome birthday goodies! Happy birthday from Elmira, ON where you can see horse & buggies, tractors, transport trucks and cars all sharing the road on our main street. I love ice cream ♥️🍦 and birthdays too 🎉🎁🎂! I do just love the ice cream birthday card!!! I have just purchased my first home together with my husband and we now call Grimsby home. Wishing you all the best for a great birthday celebration! Edmonton is home. Happy birthday SCT! Wow!! It’s your birthday, and we get all the presents!! Yay! What a fabulous prize pack! Thanks from Stonewall, Manitoba! Happy 13th Birthday! Loving all the colour in the LO and cards. Nothing says celebrate more than bright beautiful colours. I live in the province of New Brunswick Canada close to a little town called Sussex. Thank you so much for sharing so much information and fun for 13 years! Happy 13th Birthday from Berwick, Ontario. Happy Birthday SCT, from Etobicoke! Wow so many cute goodies and love the layout and card!!! Wow so many awesome prizes!!! Happy Birthday!! Sending Thanks from Auberry, California for all the awesome birthday celebration inspiration and prizes! What a special treat!! Home for me is Vancleave, MS!! What a wonderful company and fabulous giveaway!! I live in the northeast corner of Ohio along the shore of Lake Erie. Thanks for showing so many creative ideas. I love the projects made with the Crop and Create stamp set! So fun and festive! That shaker card is the ice cream bomb! I love it. Love the prizes! Happy 13th Birthday SCT! I call home New York, New York. Happy birthday from Dryden Ontario. So inspired and I hope I am lucky when it comes to the fab prizes too! Love the Crop & Create stamp set!! I have a few layouts I could add some of those stamped images too! Great team!Wonderful prizes!I am glad that you give the opportunity to learn and be inspired by beautiful projects! What a way to celebrate 13 years! Happy birthday from Cleveland, Quebec! Congrats from outside Zion National Park! Happy Birthday from Dothan, Alabama! Love the layout! Thanks for the chance to win!! Happy Birthday from Knoxville, TN!! Wonderful products and ideas. Thanks for all the years. Great cards! Happy birthday SCT from Toronto! Happy Birthday Celebrations! I am from Northern Ontario and thank you for the opportunity to win some fantastic prizes. Love jens shaker card – so fun!! Hello from beautiful Locust Grove, Georgia! Wishing you a happy 13th Birthday SCT & many more!! Happy Happy 13th! All the craft feels for these great prizes! Waving from Waterloo, ON! Sending love from Spokane WA! What a wonderful way to celebrate your 13th. Good luck everyone. From Oakville ON I wish SCT a very happy birthday. Great inspiration and awesome prizes to give away. Thanks! Happy Birthday from beautiful Southern oregon! The inspiration is just amazing and the goodies are such a bonus! Happy 13th! Home has continued to be Winnipeg MB for my whole life …. I love to travel, but will always return here because my roots are firmly planted in our prairie soil! Happy Birthday from Prairieville, Louisiana!! Love your magazine and all the beautiful project ideas!!! Many, many more years of success!! Happy 13th Birthday! You are my go to reference for all things creative! Happy birthday from Ekaterinburg, Russia! What a wonderful prizes! Thank you for the chance to win! Sending birthday wishes from Glen Ellen, CA! Congrats on #13 SCT. Awesome products from amazing sponsors deserves a huge THANK YOU! Awesome projects! I love making birthday cards! Happy Birthday from the Land of 10,000 lakes (MN)! Hopefully they won’t be frozen much longer! Happy birthday SCT from Southern California! Loving it all from Corona CA! Home is southern AZ, but when I visit “back home”, that’s east TX. Love all the cards. Happy 13th. Born and raised in San Jose. CA. Happy Birthday 13th SCT! Lucky 13! My home is in southern Colorado. Enjoying this birthday with you in Kristinehamn, Sweden! Happy Birthday/ Day 2 SCT!! Home has always been Sarnia, Ontario !!! Bluewaterland as it is often called!! Such a wonderful assortment of products offered by your partners during this celebration!! As always, hope to be a winner!!! Thanks for the chance!! Home is Pirt Elizabeth in South Africa. A wonderful day 2 in the birthday celebration! Loving everything from Ottawa, Ontario Canada! My home is in Christmas Valley, Oregon. but mainly PA- Hershey Chocolate bar country! Happy 13th Birthday from Lombard, IL (20 miles west of Chicago). Happy birthday from Venus, Texas – what a fantastic giveaway you are hosting – thanks so much! So exciting to to join in the 13th birthday celebration with you all the journey is endless, Wow to the great give aways and all that you do for us crafters…Cheers! Love the colors! From Olean, NY. Interesting products on this page and would love to have some. Happy Day 2 Birthday from Ayr Ontario. Fab prizes! Home is where my family is and currently we reside in a little town outside of Toronto Ontario Canada! I love seeing the fan stamps used on a different card, made me remember that I bought that awesome stamp set. Jen adding real candy to her card, awesome. Happy Birthday from Chicago Illinois! Happy Birthday! So many great ideas for the ice cream card. We need the best summer ever in Thunder Bay, considering it snowed last night!!! Ugh! Happy Birthday from Summerfield, Louisiana! I am loving the inspiration of the fun cards and layouts during this celebration. Happy Birthday from Bucyrus, Ohio. I’m really liking the ice cream stamps from Echo Park! I call Beautiful British Columbia home !! I am in love with the color combination on that Crop & Create layout!!!! I call Riverton, UT home. Love the Crop & Create page! Happy birthday from Kannapolis NC! Happiest of Birthdays to THE best Scrapbooking Magazine/company EVERRRRRR!!!! Hello from Toronto!!! Love that page from Virginia and the stamp and die set for the crop and create! So many memories linked to this stamp set of good times! Thanks for the chance. Wish there were more Crop and Create opportunities here in the US! I’m from Galax, but we’re on the Notth Carolina border! Happy birthday from Lee’s Summit, MO! Hello from Thunder Bay, Ontario. Love all the special giveaways. Happy 13 from Winnipeg! Love the shaker card…that is one of my weaknesses…ice cream sure…but I mean shaker cards! Thanks so much for today’s inspiration! Happy Birthday from San Jose, Ca! Best wishes SCT on your 13th year, from the USA! Happy Birthday from Rochester, NY. Happy Birthday from Vancouver Island, BC I love all the creativity on here. Such pretty colors! HBD from Maple Ridge! Happy Birthday from the beautiful Island of Puerto Rico! Thanks for this celebration and the opportunity to win the amazing prizes you are sharing! so much inspiration! love that shaker card! Loving your giveaways up here in the Great White North, Toronto! Love that SCT gets a Birthday WEEK for celebrating…I’m going to do the same! HBD from Matthew, NC! Happy Birthday SCT! Love your magazine! Thanks to your partners in giving such a fun prize! I hail from Arizona, US. Happy Birthday from Maple Ridge BC. Awesome prizes. Happy birthday from Laval, QC. Thanks for the chance to win those great pirizes! Happy Birthday from Saint John NB Canada! Thanks for sharing such beautiful projects and giving us a chance to win! Happy 13th Birthday from Weston Wisconsin! Home for me is Smiths Station, Alabama. I hope you are enjoying your birthday as much as I am. Thank you for the incredible inspiration and also to the sponsors for giving us the opportunity to win such wonderful prizes. Happy 13th Birthday. A huge thank you to your amazing sponsors for providing such wonderful prizes. Happy Birthday SCT from Smith Mountain Lake, VA. The prizes are amazing and all the designers offer so much inspiration to create and pursue my love of paper crafting. Thank you! Happy birthday from Whitecourt, AB! Birthday greetings from Airdrie, Alberta! Hello from Brampton, Ontario. Great giveaway to get some card making, travellers notebook and scrapbook layouts completed. Thank you to all the sponsors! Thanks for the inspiration and chance to win. Happy Birthday wishes from Aurora, Illinois. Fabulous inspiration and prizes. I think I need to create a very happy birthday card tonight. Happy Birthday, SCT from New Bern, North Carolina! Happy 13th birthday SCT. Awesome prizes today. I am from Avon, Indiana. Shaker cards are a big hit in Brampton! Happy Birthday SCT, from Ontario! Awesome projects, really inspiring! I esp love Jen’s card. I am from the Philippines but currently living in Saudi Arabia with my hubby and daughter.